This was first posted in my Clear Sight blog on November 22, 2014; I’ve edited it a bit. How would you choose the world’s top five diamonds? By cost? Carat? Who owns them? People occasionally pay insanely high prices for a stone, but a truly historic diamond’s monetary value also depends on social factors that change over time. That’s why you can’t go by price. Wealthy people certainly pay for excellent quality, but they also buy gems to impress other people or to fulfill some other inner need; or to possess something that was once owned by somebody they admire; or for historic value; or for a multitude of other reasons. Jewelers, of course, cater to social factors, but at the business level they have to judge a diamond objectively. You might already have heard about the 4 C’s – clarity, color, cut and size. But what is diamond type all about? The perfect diamond is a crystal of pure carbon. However, diamonds form under natural conditions of high pressure and temperature and can never be completely pure. Nitrogen and boron are the impurities we’re going to look at for diamond type. Most transparent and colored diamonds are type I – they contain a measurable amount of nitrogen. In simplified terms, type Ia stones have the nitrogen atoms sitting close to each other. 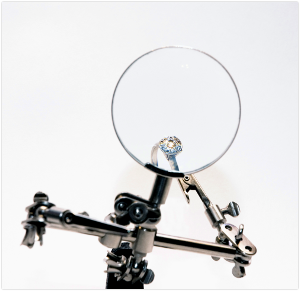 This affects the diamond’s clarity and color. Type Ib diamonds also contain nitrogen, but the atoms are further apart. This type is rare and often has a bright canary yellow color. Type II diamonds contain very little nitrogen or any other impurity except boron. There are two subtypes. Type IIa diamonds are almost pure. They make up 2% or less of all natural diamonds and will be either colorless or very lightly colored. Four of the diamonds on our list today are type IIa. Type IIb diamonds contain enough boron to turn them blue or bluish-gray. You’d think that would make these stones less valuable, but their rarity makes them extremely precious. Only about 0.1% of all natural diamonds are type IIb, and we’ll be looking at one of them below. This 33.19-carat (6.638-g) type IIa diamond used to belong to the Krupp family of German industrialists. It was stolen from Vera Krupp in 1959 but recovered. It may be internally flawless, but officially some very slight inclusions have been noted. 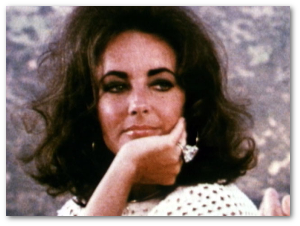 Today the stone is known as the Elizabeth Taylor Diamond. This gem is a good example of how price varies for the same stone. Richard Taylor paid over $300,000 for it at an auction (a record at the time) and gave it to Miss Taylor in 1968. It was her favorite jewel, and during the estate sale in 2011 after her death, a South Korean business group paid almost $9,000,000 for it. Is the stone actually worth that much, or is much of that price added for the Elizabeth Taylor brand? Why, oh, why didn’t they name this the Millennium Falcon and cut it accordingly? Flawless and weighing 777 carats (5.5 ounces), this type IIa diamond was found in a stream bed on the property of Zaire’s Mbuji-Mayi Mine in 1990. It was the height of the Zaire’s civil war, and De Beers bought the huge crystal. The millennium referred to is Y2K, but in 1999 the Millennium Star first went on display at London’s Millennium Dome, so there’s that, too. 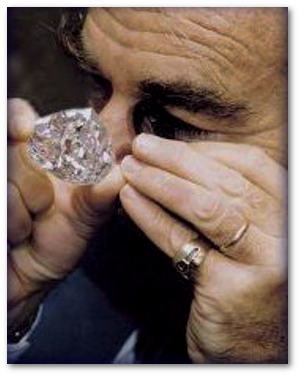 The Star was the featured gem, and De Beers had it insured for £100,000,000. Of course somebody tried to steal it. The Metropolitan Police caught the thieves before they could make their getaway. Kris Hollington’s Diamond Geezers is about this attempted robbery and it also includes a detailed history of the Star. In 1988 – the 100th anniversary of De Beers – a rough type IIa diamond weighing almost 600 carats (4.2 ounces) was found at the company’s Premier Mine in South Africa. Of course they named it the Centenary diamond. The huge stone was flawless and had the top color grade of D. It was very carefully cut into a 273.85-carat (1.9-ounce) modified heart-shaped brilliant with 247 facets. 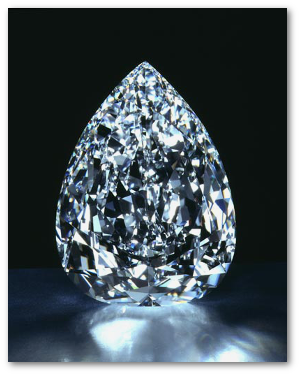 The Centenary diamond was insured for over $1,000,000 when it went on display in 1991. De Beers loaned it to the Tower of London for a few years, but this valuable gem is now in private and understandably anonymous hands today. In January 1905, the Premier Mine’s manager found a type IIa diamond weighing over 3,000 carats (1.3 pounds). It was, and still is, the largest gem-quality diamond ever found. The media christened it the Cullinan diamond, after the mine’s owner Thomas Cullinan, and the name stuck. The South African legislature bought the Cullinan diamond and presented it to Britain’s King Edward in 1907 for his birthday. 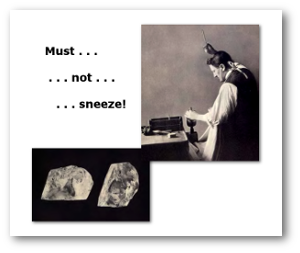 In 1908, I. J. Asscher cut the huge crystal ino nine major stones, 96 smaller gemstones, and 9.5 carats of unpolished fragments. Cullinan I – D color grade and potentially flawless – was cut into a pear shape. Now, as the Great Star of Africa, it sits on the Royal Scepter With Cross. 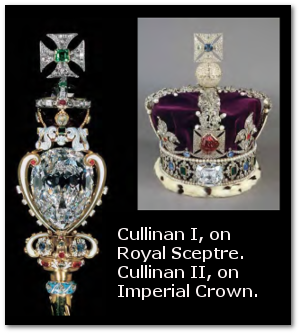 Cullinan II, the Lesser Star of Africa, is also D color and potentially flawless. It decorates the Imperial Crown as a 317.4-carat (2.2-ounce) cushion-shaped brilliant. This 45.52-carat gem, the biggest blue diamond in the world, is the only type IIb stone on our list. It came from Kollur, one of India’s Golconda mines. A French traveler brought it to Europe in the 17th century, where it eventually was sold to King Louis XIV. It disappeared for 20 years after the French revolution. Its history after that is a little uncertain, but this diamond eventually ended up recut and in the hands of British banker Henry Thomas Hope. 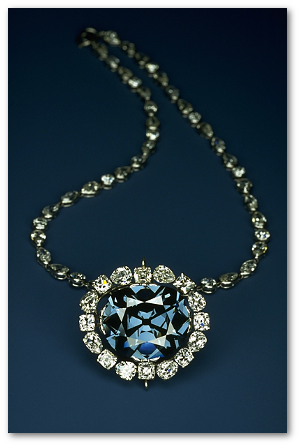 Now known as the Hope Diamond, it was sold and resold repeatedly until Harry Winston bought it in 1949 and gave it to the Smithsonian Institution, where it now is displayed as part of the National Gem Collection. 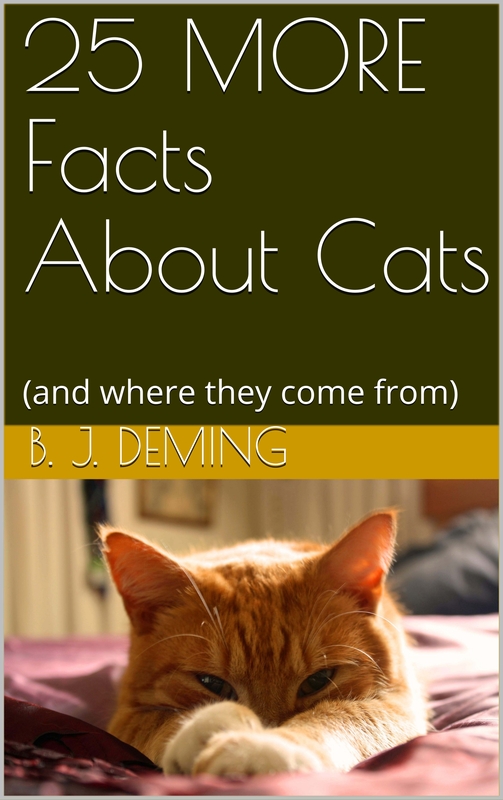 It has been studied intensively at the Smithsonian. 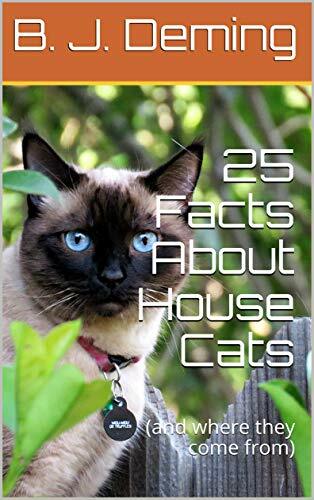 Here in detail is everything you might want to know about its history and science. There you have it. It may seem odd, but I think the most valuable diamond in the world is blue, not transparent. Featured image: Public Domain Photography, Flickr.